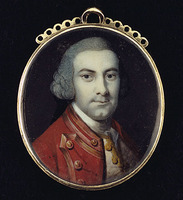 McDONELL (Aberchalder), HUGH, army and militia officer, land surveyor, politician, and office holder; b. c. 1760 at Aberchalder House, Scotland, son of Alexander McDonell of Aberchalder; m. first a Miss Hughes; m. secondly a Miss Ulich, daughter of the Danish consul in Algiers (Algeria), and they had two sons and eight daughters; d. 1833 in Florence (Italy). In 1773 Hugh McDonell’s father and his uncles John of Leek and Allan of Collachie led a major migration of Highlanders to North America, settling on Sir William Johnson*’s estate in the Mohawk valley of New York. In January 1776 McDonell, along with his father and uncles, was taken prisoner by Major-General Philip John Schuyler. He later escaped and returned to Johnstown. Having collected about 100 loyalists, he fled with them to Montreal in May 1777. There he joined the King’s Royal Regiment of New York as an ensign; he was promoted lieutenant in 1781 and retired on half pay when the regiment was disbanded in 1783. The next year he joined his relatives in what was to become Upper Canada, taking up a 500-acre grant in Township No.1 (Charlottenburg). In 1788 he was appointed a deputy land surveyor. Until his retirement from the post in 1794 he plotted lot, concession, and township boundaries through the virgin forest of the Eastern District. In 1792 McDonell and his brother John* were elected for Glengarry County to Upper Canada’s first parliament, an indication of his family’s local prominence. 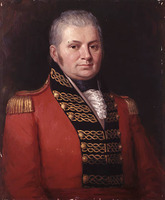 Perhaps it was as a politician that McDonell caught the eye of Lieutenant Governor John Graves Simcoe*. In June 1794, in spite of a modest military background, he was appointed the province’s first adjutant general of militia. Later, through the influence of his brother John, he joined the Royal Canadian Volunteer Regiment as a captain. The disbandment of the volunteers in 1802 left him in near destitution, a state exacerbated by the government’s failure to pay a portion of his salary. In 1803 he became lieutenant-colonel of the Glengarry militia, John then being the colonel. McDonell journeyed to England in 1804. There Robert Mathews*, former military secretary to Governor Frederick Haldimand*, attempted to find him a position: “a valuable officer is lost to himself and to the service, whose abilities [would be useful] either in a civil or a military capacity, particularly in Canada, where his knowledge of the French language, the customs and manners of the people, and of the interests of the Indian nation, might be turned to good account, while the services and sufferings of a very deserving officer would be rewarded.” In London, McDonell sought the patronage of the Duke of Kent [Edward* Augustus], whom he had met while the duke was in British North America. 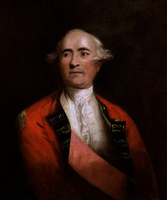 Edward secured him an appointment as assistant commissary general at Gibraltar in 1805; five years later McDonell accompanied Lord Cochrane to Algiers and the following year he became consul general there, a position he held until 1820 when he retired to Florence. AO, RG 1, A-I-1, 18: 37. PAC, RG 5, A1: 407–12. J. G. Harkness, Stormont, Dundas and Glengarry: a history, 1784–1945 (Oshawa, Ont., 1946), 36–37. J. A. Macdonell, Sketches illustrating the early settlement and history of Glengarry in Canada, relating principally to the Revolutionary War of 1775–83, the War of 1812–14 and the rebellion of 1837–8 . . . (Montreal, 1893), 105–7, 112–13. “Hugh McDonell,” Assoc. of Ont. Land Surveyors, Annual report (Toronto), 1922: 97–101. Allan J. MacDonald, “McDONELL, HUGH,” in Dictionary of Canadian Biography, vol. 6, University of Toronto/Université Laval, 2003–, accessed April 19, 2019, http://www.biographi.ca/en/bio/mcdonell_hugh_6E.html.